The former German international has been told to justify his £350,000-a-week wages by new Gunners boss Unai Emery. Emery denied a rift with Ozil – who scored in a 2-1 win at Newcastle on Saturday – but says he wants to see more from his highest paid player, who still has another two-and-a-half years on his deal. Jose Mourinho was keeping tabs on him last season, before Ozil put pen to paper on his new contract, and is still interested if he becomes available. The Portuguese boss made no secret of his disappointment at a lack of summer spending in the last transfer window with just Diogo Dalot, Fred and Lee Grant his only new arrivals. United’s executive vice-chairman Ed Woodward refused to splash the cash on a central defender and now faces the prospect of having to please his manager once again when the transfer window reopens in the New Year regarding Ozil. Meanwhile, Emery is keen for the former German international to contribute more goals for the Gunners this season. Ozil has been criticised for not scoring enough goals but took steps towards silencing his critics as he scored his first goal of the season against Newcastle in a 2-1 win. “His [Ozil’s] quality helps the team, it is important he scored,” Emery said. Goals from Granit Xhaka and Ozil against the Magpies saw Arsenal register their ninth and tenth different goal-scorers of the season. Emery is keen for everyone within his squad to get on the score sheet but does expect his attacking players to do more. “It’s good news. We need to improve and score more individually, we need we work every player, not only the attacking players the midfielders and centre backs from set pieces,” he said. 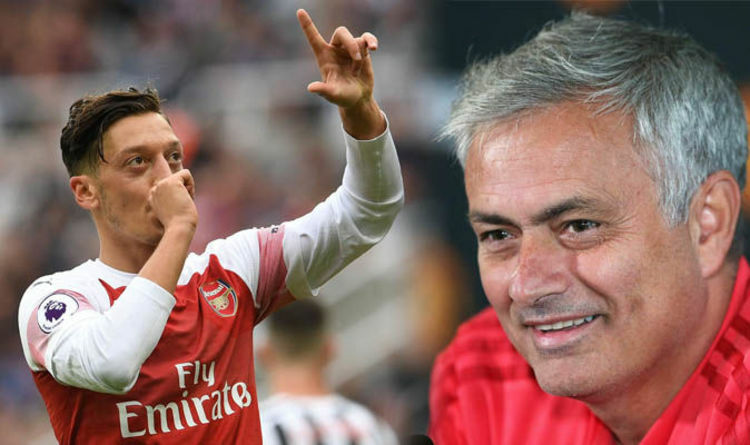 Although Mourinho is monitoring the situation with Ozil at Arsenal, the midfield playmaker dismissed speculation of a rift with the manager after their third Premier League victory of the season. “I am very happy to play for Arsenal and especially for the new coach,” Ozil said. “He knows what he wants and the team accepts that, we have a good relationship. Ozil’s appearance against Newcastle marked his 200th appearance for Arsenal after being with the Gunners for five years. “I’m happy but most important we take the three points,” he said.